I'm making sets of tags for my mom, sisters, and sisters-in law, and this is the first of the set. 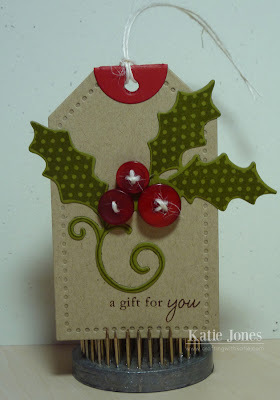 All of the materials I used for this one are from Papertrey Ink. The tag was cut with the Tag Sale #3 Die. Last year I bought the Holiday Button Bits Stamp Set, and I was so excited when the coordinating dies were released this year! I used them for my holly, and the sentiment is from the stamp set. 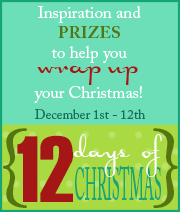 Don't forget, My Creative Time's 12 Days of Christmas is still happening! Be sure to click on the link below to see what Emma and some of the design team have created for you today! Cute tags! They will love them. Gorgeous tags Katie! They are going to LOVE them! Katie ~ This is so GORGEOUS! I LOVE that holly and how you added the button!!! LOVE that little stem thing too!!! 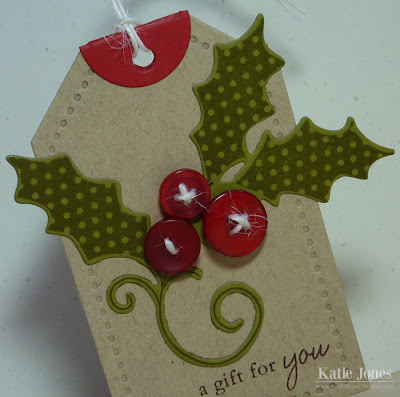 They will LOVE thier tags ~ what a GREAT gift idea to give someone ~ actually rather CLEVER!!! Awesome job as always! love love love your tag!!!! BEAUTIFUL tag! LOVE the button berries!!! GREAT gift idea! YAY!!!! I'm so excited we are getting tags this year, I just used my last one, and now my packages seem so boring! I can't wait! I love the button bits sets from PTI, so cute. Love your little tag. Great job. THis is a beautiful tag! I don't know why...but I'm having such a hard time getting myself motivated to do anything. sigh...I think I need a power booster.